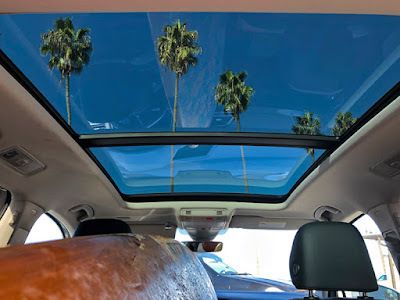 Kymri and 2018 Volkswagen Tiguan SEL Premium - Top Pick for Surfers. Photo by envious surfer dude. Disclosure: Volkswagen provided me with the 2018 Tiguan SEL for a week for drive-review purposes. I drove it round-trip Cardiff (San Diego) to Los Angeles, and one morning to La Jolla Shores when I got home. For 4 days in between, the Tiguan was shared - driven, fondled, put to the test, folded, unfolded, and dare I say, fan-girled over by 30 other women journalists, bloggers, and influencers at the first ever #Drive2Learn conference with A Girls Guide to Cars, sponsored in part by Volkswagen. You can find links to their VW Tiguan reviews at the end. My review here is my honest, candid opinion in my voice alone. Just months after moving into our first home in Santa Barbara, we learned I was pregnant. We needed a new car. We wanted the best safety features, plus plenty of space for dogs, luggage, groceries, and the visiting in-laws. We went in to test-drive a used Jetta, but we drove home in a brand-spanking new 2002 Volkswagen Passat GLS wagon (TURBO, of course). 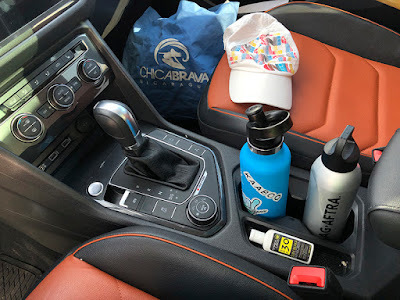 We justified the splurge - we were about to become parents, we would be carrying precious cargo, and the minivans du jour were definitely NOT our style or speed. The VW paint color sealed the deal: Blue Anthracite Pearl. When our baby girl was born, we could only describe her eye color as “blue anthracite” since they matched the Passat exactly. It was clearly meant to be our first family car. We still own our 2002 VW Passat, and we still drive it. While it’s not our day-to-day car, it remains our go-to car for family road trips with the dogs, and for camping. Admittedly, I'm the more regular driver with a very specific use - to stash my 9 ft. longboard and head to the beach when the waves are less than pumping. Of course, there are roof racks, and I can certainly pile up several boards on top; but when it’s only me, I’m lazy. I just want to get to the beach while the coffee in my thermos is still piping hot. Although VW no longer produces the Passat wagon, my recent experience driving the 2018 VW Tiguan 2.0T SEL Premium quickly convinced me that this SUV would be today’s equivalent (in Silk Metallic Blue). I’ll show and tell you why in just a bit, but first, a short history lesson. There’s no denying VW is the iconic brand favorite amongst southern Californians and surfers everywhere. Think about the classic convertible Beetle, the Westfalia camper, the Bus/Vanagon, the 2002 Passat Wagon (ahem)…you get the picture. I honestly don’t know which came first - Volkswagen automobiles or surf safari road trips. Both have evolved and intertwined for decades, with no end in sight. This is your prompt to bookmark this space because I can’t wait to tell you what’s coming next from VW in 2019! But first…. Before I met the Tiguan, I would never have thought it a fit for my little family of 3. I passed it off as yet another SUV designed for soccer-moms and dance-dads to chauffeur their various kids to their various schools, sporting events, rehearsals, recitals - that whole scene - a supersize SUV for a supersize family. I wasn't wrong - it IS, IT IS ALL THAT - a worthy and desirable set of wheels for such a family. But would it work for us? More specifically, ME? Let's talk family. I can easily imagine giving the Tiguan serious consideration if we had 2, 3, 4, even 5 kids! That's right, you can load up to 5 kids in the back, safely and securely, when you add the 3rd row Seating Package ($500). I place the emphasis on "kids" for that third row, it's a bit tight for full-sized people. But in my case, my family is small - 2 adults and a teenager. 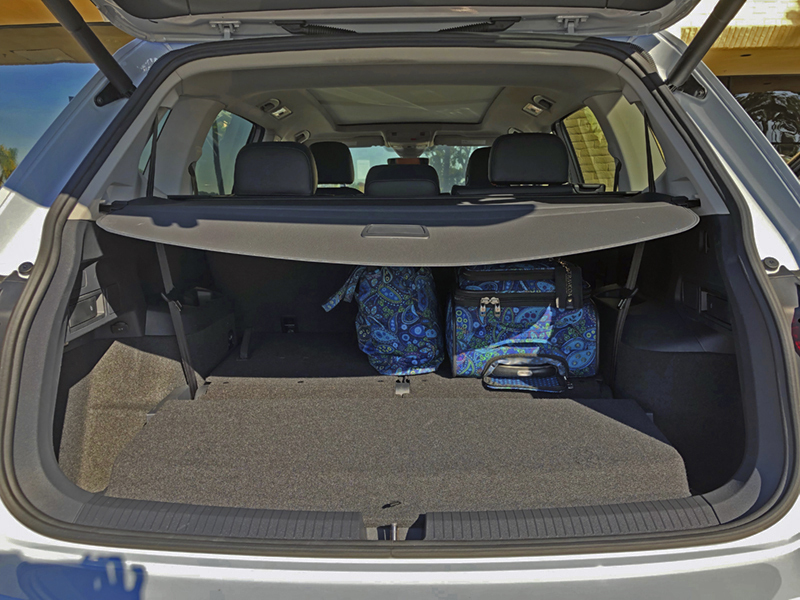 That spacious interior real-estate better serves us with both sides of the 3rd row folded flat, maximizing the cargo space while still accommodating up to 5 people in spacious comfort. Even with 2 dogs factored in, still plenty of room for everything else. I was hesitant at first, stepping up into this giant version of a VW SUV (classed as small) with a higher profile than my all-too-familiar 2002 Passat. I sat in the driver's seat and scanned for all the important stuff I need to locate before I drive. Pretty much all of it was in the same place as it's predecessor of 16 years. Nice, I'd be ready to roll as if I'd been driving the Tiguan all those years! But of course, there were brand new things - USB ports, a digital dash cockpit (dashboard/monitor), safety features and technology that had evolved leaps and bounds since 2002. Given that I've been attending auto shows, media drive events, and assigned fleet loans to review and write about for the past 5+ years, I was no stranger to the latest in automotive tech. That said, Volkswagen couldn't have made it easier. "The 2018 Volkswagen Tiguan has the most seamless and user-friendly hands-free tech interface I've ever experienced, and that speaks volumes." I turned on the power. My phone was detected and popped up on the monitor - the Tiguan asked if I wanted to sync it. I answered yes, and boom, it was done. I literally did nothing. She asked a few straight-forward questions, I answered. She listened to my responses and handled it, start to finish. The phone was still in my bag (note: blue-tooth setting was on). My only complaint, if forced to name a negative: The Tiguan stopped short of offering to serve me coffee. I still had to bring my own. Forgetting that I wasn't in my 2002 VW, I could definitely feel the extra weight when I first drove the Tiguan. How heavy is this thing? It felt chunky, like a tank, and was roaring loud, like a truck. I pulled over and gave everything another check. Sure enough, the mode dial I toyed with earlier was set to off-road. I turned it to on-road, and drove away smoothly, quietly, and fuel-efficiently, just like my old familiar happy place in the 2002 VW. The TURBO (let's face it, I LOVE me some good acceleration) kicked in when I needed - like entering the 405 from those notoriously short on-ramps, for starters. I proudly watched my fuel efficiency monitor reach up to 31 MPG highway (my smaller 2002 Passat topped out at 34 MPG). I was more than impressed, I'd even done better than the sticker (21 city, 27 highway, 23 combined MPG). Yep, I could totally rock this SUV, girlfriend! We both brought out the best in one another, and had each other's backs. Much like today's surfers. Today's surfers are not limited to dudes with gnarly hair and punks on skateboards. We are more. We are women. We are moms. We are business owners, teachers, cancer-survivors, dancers, yogis, first responders, college students, caregivers, lesbians, mothers-to-be, world travelers. 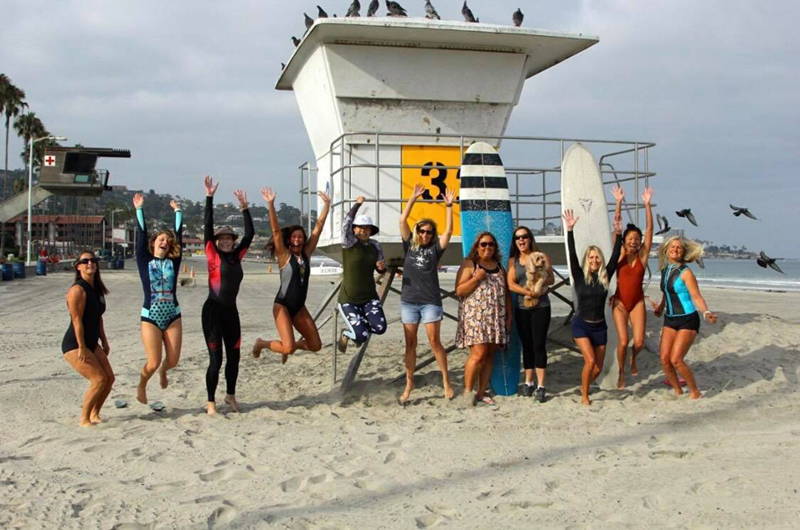 That's just a sampling of the female contingent you'll find in the water on any given morning at La Jolla Shores. The men? They're cool, too. They love us, we love them. It's all good. But, the boys could never proclaim "I surf like a girl" with ego intact. Just sayin'. Do You Drive Like A Girl? 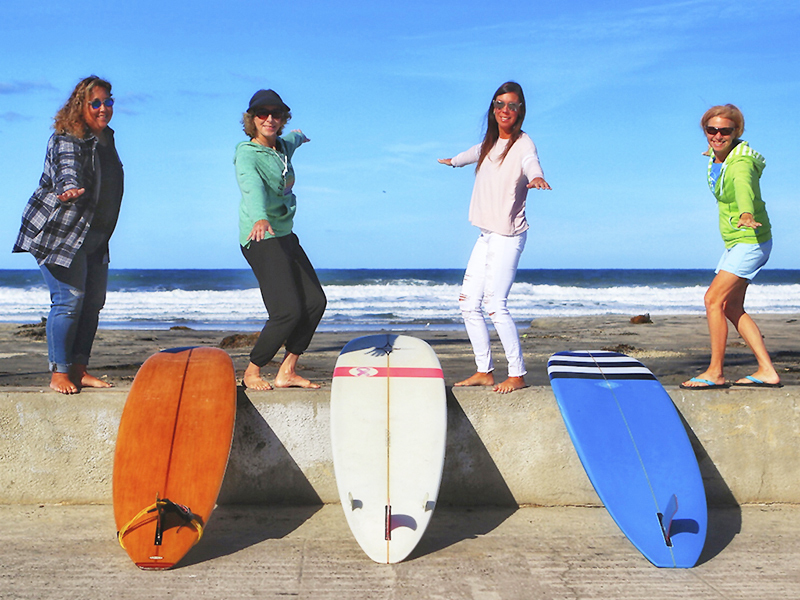 I surf like a girl and I own it. I also DRIVE like a girl, and I own it. You've probably heard or seen "Get in, sit down, shut up and hang on!" Just throw in a "buckle up" and that's me, along with many of the girl/mom drivers I know. We don't lose our sense of adventure in motherhood, we gain the perspective of being responsible role-models, raising our kids to be confident, bold, AND sensible. Let's get back to filling that spacious interior, and examine how spaced out it really is. It was my last morning with the Tiguan. I'd spent a week driving between wildfires burning in LA and the dry deserts of Greater Palm Springs. I'd been working round the clock, I was dehydrated, and just needed nothing more than a refreshing paddle-out and waves in my beloved ocean to bring me home. First, I folded down the third row. The second row offered a 40/20/40 split, so I folded down the middle, then slipped my 9 ft. longboard straight down the center. Would there still be room to accommodate additional boards, 4 full sized surfers, gear, and a dog or two? Yes. Meanwhile, my dog Java was whining to jump in the back (her usual game when I'm loading up to surf), so I obliged. She hopped right in, circled twice, then sat facing back as I tethered her in. She proceeded to beckon all the dogs in the neighborhood to come check out the new surf safari/dog mobile (such a show off). I took some quick video and stills, then sent her back in the house so I could get to the beach before my coffee grew cold. I pulled into the parking lot at the Shores, suited up, waxed up, and paddled out. I didn't care that the waves were ankle slappers - the water was crystal clear and I could see the schools of silver grunion darting about, the rays on the sandy bottom, the (harmless) leopard sharks who aggregate here this time of year, a few other random fishes, some curious harbor seals, and my sea-lion buddy "Carlyle" who moves through the boards in the line up and pops up to say hello. I see dolphins playing further out, and migrating whale spouts just beyond....ahhhh, I'm home again. Surf, surf, surf. 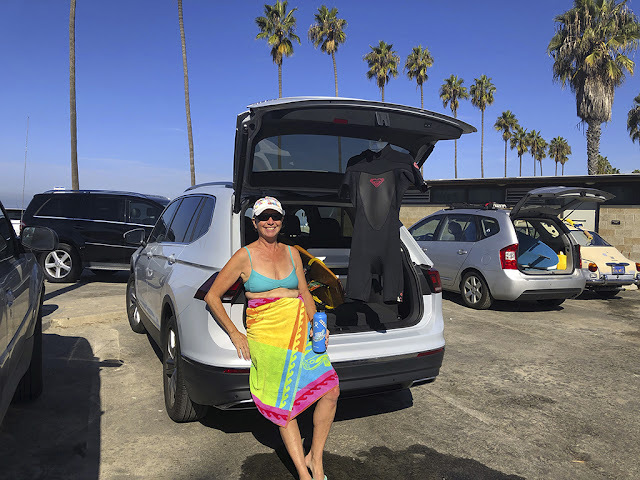 Back ashore, I opened up the back of the Tiguan, hung my wetsuit in the sun, turned on some tunes, took a few more pics and video, talked about the car with friends and curious strangers alike, loaded back up, and reluctantly drove back home to turn over the keys. Before I met the VW Tiguan, I never imagined we'd click, one on one, her and me. It was a magical week for us! We hit it off right away. I introduced her to the family, particularly keen for my big brother to meet her. We spent a few days working our respective jobs at the Miramonte Resort, winking to one another as we passed. We re-united again for a slow drive back in rush hour traffic, and she clocked it for us: 100 miles, 3 hours 1 minute, average speed 33 mph. Then we both had a good night's sleep and squeezed in a morning of beach, surf and BFF selfies before parting ways. Well there you have it. The 2018 VW Tiguan 2.0T SEL easily knocked out every other contender to become this year's TOP PICK model for today's surfers. It ticks every box, and is especially suited for a surf safari road trip with any combination of girls, guys, kids, dogs. Now, as we roll to a stop, please enjoy the photos, watch the video(s), and link through to see what other women have to say!